October 23, 2010 was National "Make A Difference Day". 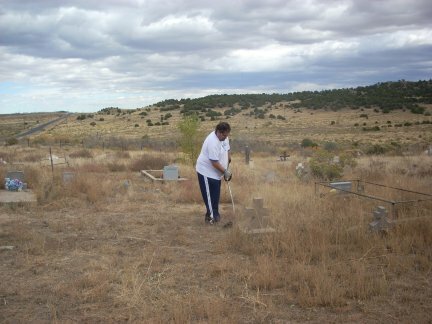 I was contacted the week prior by Diane Rother, of Denver, who wanted to set up the day to clean up St. Mary's South cemetery. 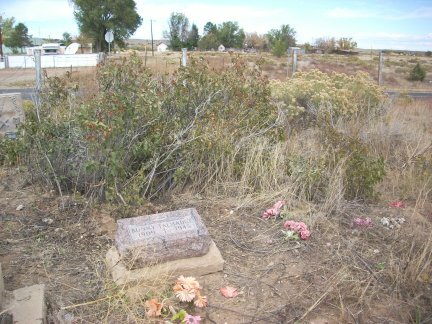 Diane and her family, being from the Youhouse - Duzenack families, go to Walsenburg once a year to clean their family plot and had noted how deteriorated the cemetery was. In expressing her concern she decided to try to get people involved. I was more than happy to cooperate and let my researchers know about the event. Unfortunately most of my researchers are from out-of-state and could not make it on short notice. 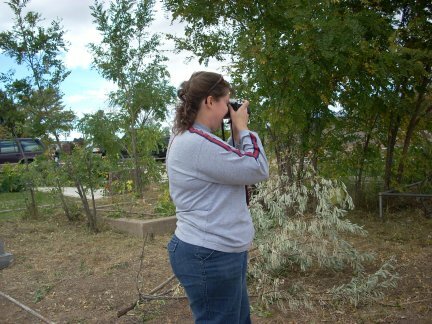 Diane contacted the parish Priest in Walsenburg, the Pueblo Archdiocese, and the Knights of Columbus of St. Mary's church. The event was in the church bulletin and announced at mass the 2 Sundays prior to the event, and was also placed in the local newspaper, The Huerfano World Journal. I sent the message out to my Pueblo, Huerfano, and Las Animas lists. The Knights said they would attend and bring donuts, but were not able to attend. The workers were instructed to show up in appropriate work gear and with tools. 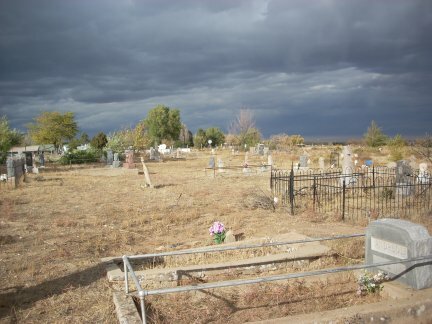 St. Mary's South Cemetery, just outside of Walsenburg, CO is an "untended" catholic cemetery. 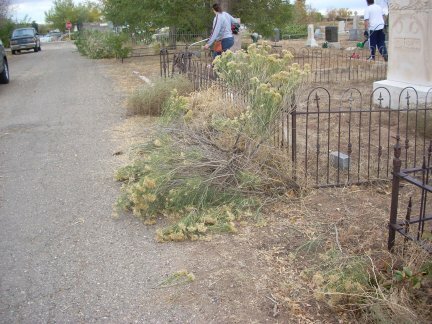 While a few families routinely tend their family's plots, by and large the cemetery is untended and overrun with weeds, overgrown grasses, and numerous trees have broken and dead branches. 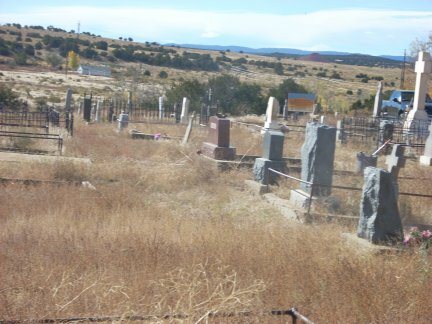 Many of the faithfully departed lived near the Walsenburg area when the coal mining industry was booming, but when the mines closed around 1950, many families moved away and were no longer able to tend to the graves of their ancesters. 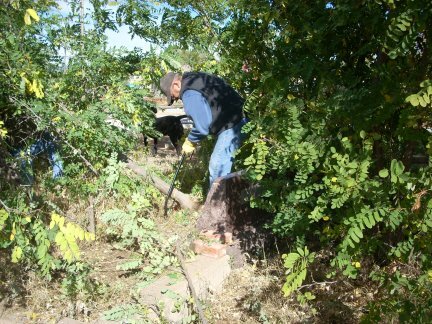 Let's get together as a community and "Spruce up St. Mary's South!" 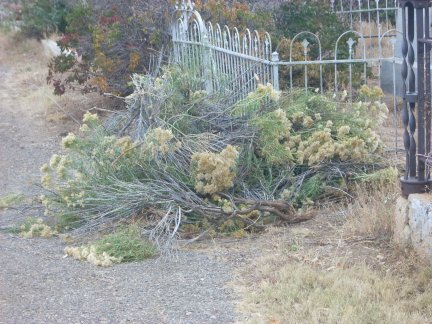 Please consider joining a group of volunteers in a fall cleanup effort. 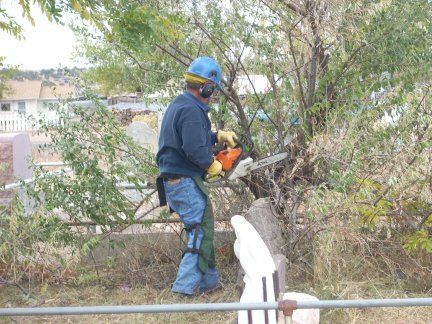 Bring your own tools- rakes, gloves, pruning shears, weed wackers and chain saws are recommended, and gas-powered tools are a must. 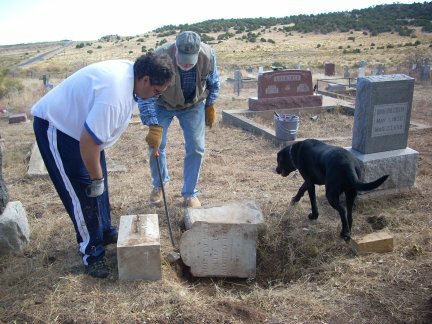 Won't you and your family consider volunteering a few hours of your time on "Make A Difference Day" to ensure St. Mary's South Cemetery remains a place of honor and respect for our faithful departed loved ones.We'll begin at 9am, Saturday, October 23, 2010. Hope we'll see you there! It was a great day, a little chilly when we first got there, we had sweatshirts on, but later it warmed up, and then got chilly towards late afternoon again. During the warmest part of the day there was a breeze, but no high winds and the breeze kept us cooled down also. I thought the weather was perfect. I arrived shortly after 9:00 and returned home at 5:00. There was also Diane's Dad, and Duane's wife Martha, who were unable to participate, and 2 of my grandchildren. Our mascot for the day was Cosmo, Rick's black lab. 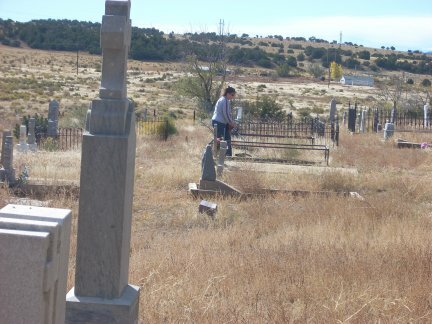 Diane had decided to tackle Section 1 of the cemetery which is the furthest eastern section. Historically this area was for unblessed graves, opposed to the furthest western section which was for the blessed graves. 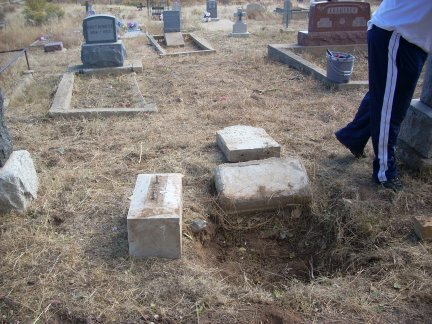 As time progressed this area also contained blessed graves. 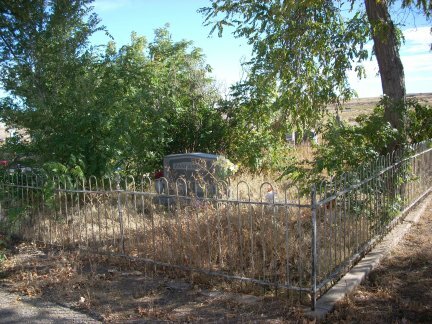 Section 1 is one of two areas of the cemetery that are almost totally neglected. 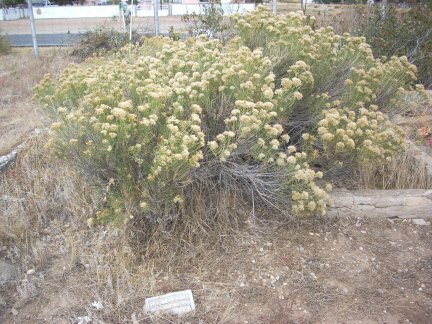 There are many chamiso bushes and cactus and honey locusts, with horrible thorns, sprouting up in many plots. 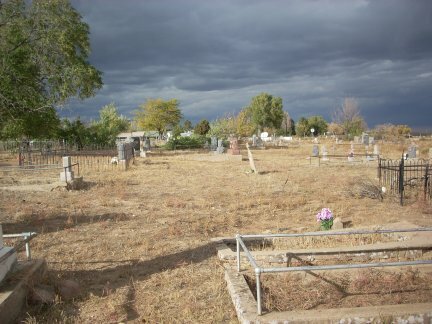 There is not a paid caretaker for the cemetery. 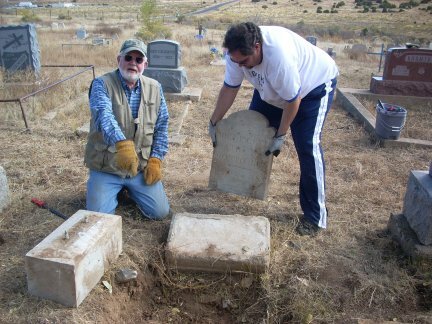 Some people from out of town hire a local person to take care of a family plot and some of the locals do their own. But these are mostly in the center of the cemetery. 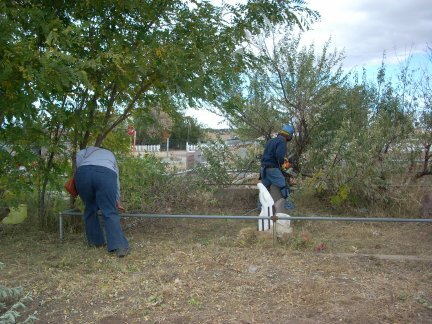 Diane and Duane concentrated on weed eating, while Don, Rick, and I tackled trees, bushes, and huge chamiso. We did find a grave that had sunken in and the stone fell forward into the grave. See the photos below. 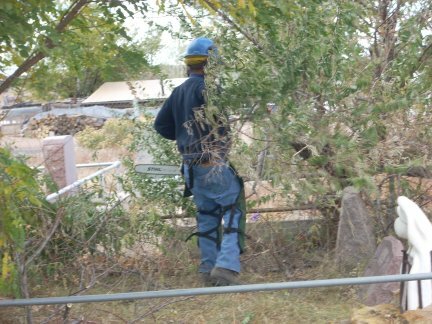 The men tried cutting the tree limbs with a hand saw but it was a time consuming endeavor. At lunch Don went home and got his chain saw. 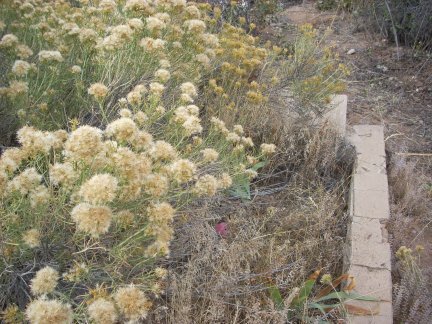 Below are photos I took and Diane said she would send the photos she took. When I receive them I will add them in. I apologize for not getting more photos, but frankly, I was just to busy. Dead trees in enclosure. Actually this plot is in Section 2, which we didn't get to. One plot before cleaning. Notice all the honey locusts that are completely covering the plot behind the big stone. 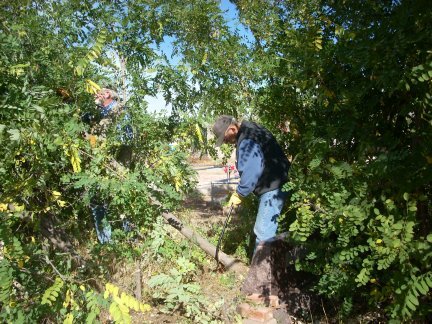 Don cutting tree limb with hand saw, Rick holding the limb down. Don and Rick cutting trees. Notice the headstone at Don's feet. The base of the tree was right up against the stone, which would have eventually caused damage to the stone. Duane and Rick digging out toppled stone. If the men had not recovered this stone eventually it would have been covered over and lost forever. Rick and Duane with Rick pointing into hole. Finally all 3 parts are out of the hole. Rick and Duane setting stone tablet on base. Sunken grave about 2 feet deep. 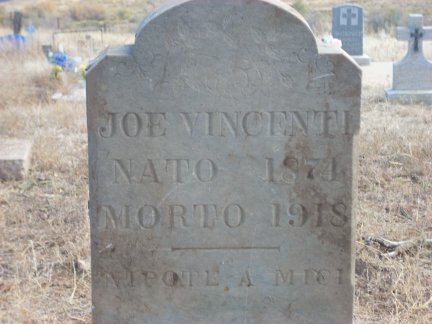 Recovered stone of Joe Vicenti. 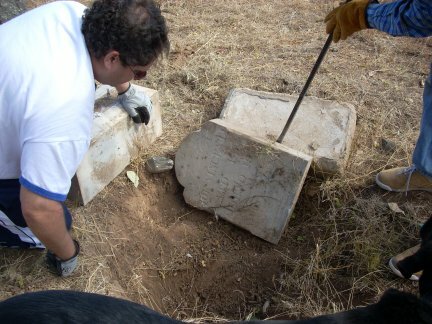 Chamiso obliterating grave of Seferino Aguirres. Chamiso obliterating grave of Guadalupe Pique. 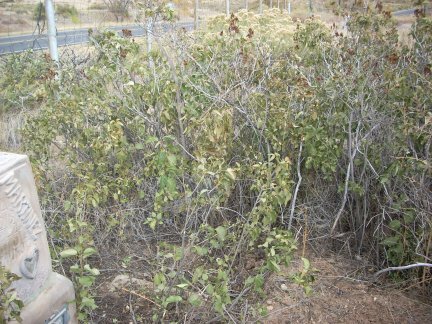 Lilacs and chamiso obliterating graves of Claude Martinez and Santanita Martinez. 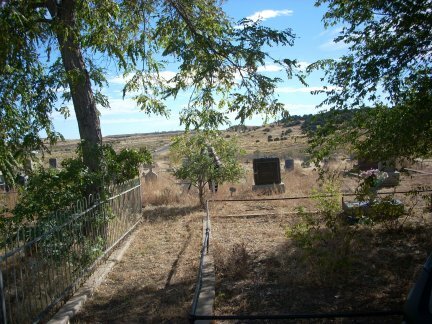 Lilac bushes and chamiso obliterating graves of Carl Gabaldon and one unknown. 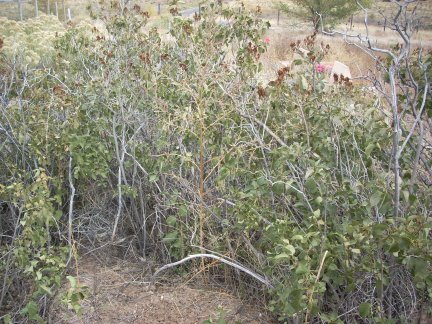 Lilacs obliterating graves of one unknown. Don with chain saw. Note the special chaps he has on. These are specifically designed for use while operating a chain saw. Don did hit his leg with the saw, and because of the chaps his leg was spared. If he had not worn them we could have had a crises on our hands for sure. 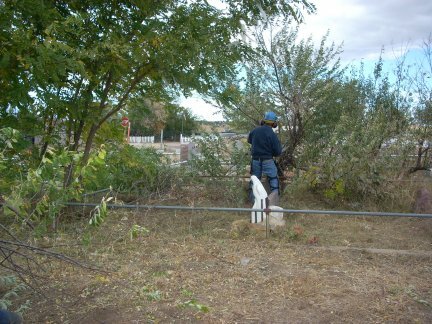 Don with chain saw, Diane gathering limbs. The Knights said they would come through with a truck and trailer and haul away the refuse. 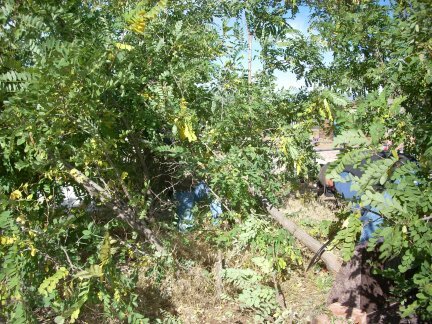 We ran out of room to pile the limbs next to the road so we made another pile further back in the area but close enough to the road. Diane has expressed interest in making this an annual event. Possibly in the Spring, or again in the fall. With that in mind, I suggested she contact the Scouts, fraternal clubs, high school football team, people that have to do community service, prisoners, and whoever else we can think of. If you have any suggestions please let us know. 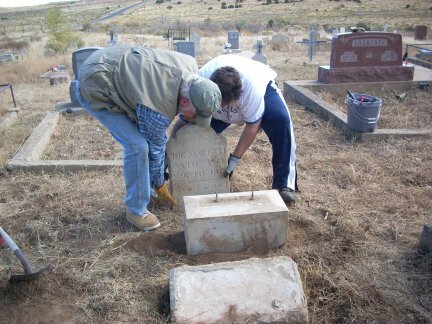 We also need one of the local mortuaries to volunteer their equipment to re-set the larger stones that can not be lifted by human power alone. 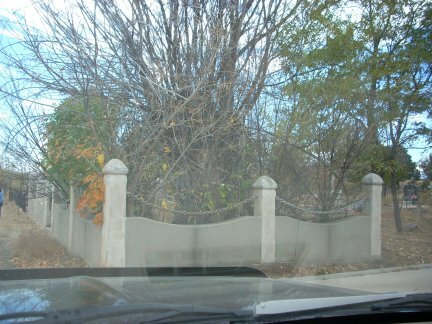 It would also be great if a local tree company would volunteer to come in and trim the dead branches out of the larger trees, such as in the plot in the first photo. Some of this just has to be done by professionals. 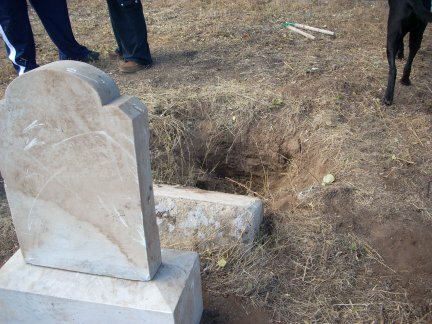 Someone needs to haul dirt in to fill in the graves that have sunken. 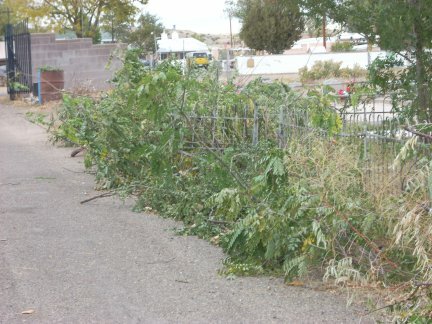 We also are in need of funding to pay for expenses such as gas for the weed eaters and chain saws, trash bags, vegetation killer, and trimming string. Maybe some of the local businesses could donate. It would also be nice if one of the local restaurants would provide lunch for the workers. Each of us provided our own transportation and lunches, and we didn't mind doing that, but I know it cost the Rother family quite a bit as they had to have motel rooms for 2 nights plus traveling and food expenses. 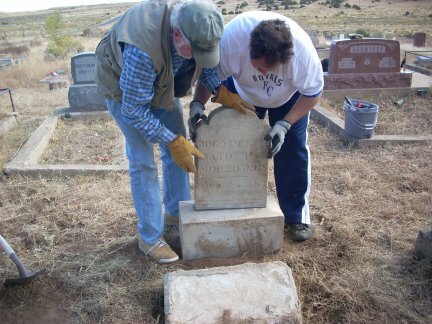 We did not get done with section 1, let alone even get to the rest of the cemetery. But I guarantee you we did the very best we could. My favorite saying is "every little bit helps!" Utmost thank and appreciation to all the workers, believe me they worked really hard and I'm sure everyone was worn out at the end of the day. THANK YOU Diane, Duane, Rick, and Don for CARING!! And a very warm hug for Diane for putting this event together!